We begin our day with play and then phonics, or phonics and then play. It depends how the children are on that day. Play is self-directed completely by children and they are allowed inside or outside. At the moment a favourite mode of play is 'teachers' but the kitchen is popular as are made up ball games outside. Of course you can't go past a good scooter or bike ride either and writing in our blank books and creating our own art from loose parts is a favourite. Following phonics (we use a bit of a mixed approach with this) we will move back to play. I use the children as my guide, but number agent time usually starts around 10am. This has been a huge success so far with amazing results so far. The math talk going on is incredible, the confidence is brimming and imaginations are firing. Number agent time is like stepping into a story book, we play the hero and defeat a villain each day...such a lot of fun. We use play-based time to pull out our individual readers. Number Agents takes us to morning tea usually. At the moment swimming puts a wedge in our time following morning tea, but we have another self-directed time after morning tea, again we use this time to catch up with our readers if needed. After lunch we usually do a form of reading to. Sometimes this is a large shared book, but it could equally be a favourite story to read and talk about. Children are very familiar with our version of Daily five now and settled into a short time of practice. We like to fit another play based session in here then a short time writing together. The afternoon is fluid and if children are really into one particular thing, we will allow them time to do this. We love to get out in the bush if we are able to. *Growth mindset activities used early on have allowed for a brilliant mindset and we will repeat these activities in Term 2. Puppet videos mimicking the problems new entrant children commonly have settling in have also been a winner. *New children settle quickly and are much more likely to strike up a wide range of friendships than they used to. *Girls work with boys and boys work with girls, there are no noticeable divisions. *They are very visual and notice much more about their world. Their awareness of patterns is excellent. *When we do require them to be in a teacher directed situation they are extra focused and engaged. We don't have the wriggly worms we used to have. *There is not noticable difference in reading and writing levels...spending less time focused on these areas in a teacher led situation does not have a detrimental effect. In fact I would hasten a guess that writing levels especially will be better. More important than levels of course is that children want to read and write, the love it, they want to learn and drive it themselves a lot of the time. *We have continued to have no devices in our class...best thing we have ever done for social interaction. Children don't even notice. *Using seesaw has been a lovely authentic way to promote and share our learning with parents. It has also been a great way to build an appreciation and understanding of the importance of play. *Our class is fluid, we are all a lot more relaxed and this passes onto the children. We are able to make the most of learning situations through the play and don't sweat it if we don't get through everything we need to. I am excited to move into Term 2, loving play-based learning and can't wait to introduce the next lot of villains to the Number Agents. My short book the Power of Play is Available here and it summarises a bit more of what I do. When did we standardise childhood? Number Agents - Why, What is it, What isn't it? 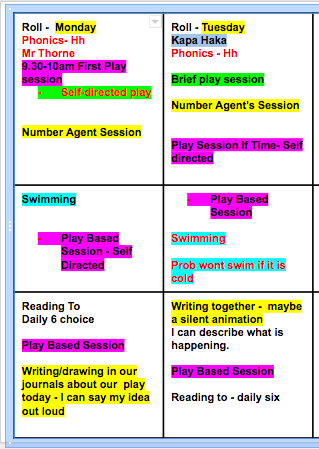 Visual Strategies - Why are these so important?